This weekend is Diwali, an important festival in India. 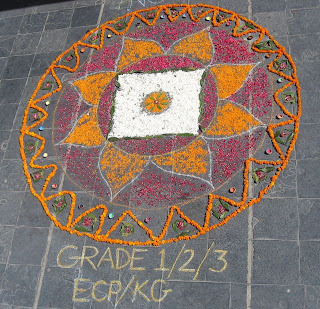 In preparation, on Thursday the elementary students created rangoli designs in the Quad. 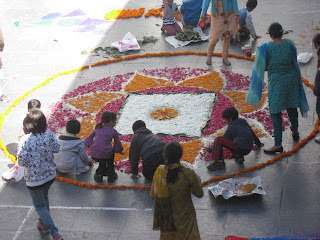 Rangoli is a form of sand-painting decoration that uses finely ground white powder and colours, and is used commonly outside homes in India, especially during festival times. 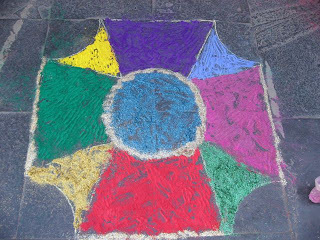 The children did seven small designs and one major one with flower petals. It is beautiful! When the students came for lunch, they all carefully walked around it so it wouldn’t be destroyed. This morning (Friday) it is still in quite good shape, with a few leaves and petals slightly out of place.